Even Jesus found the going hard. He met with ridicule, slander, and hostility. He was therefore qualified to tell His followers to endure. Last night my sleep was continually interrupted by leg cramps. Apparently my daily exercise routine had conditioned my legs to need this painful exercise I had introduced it to. So this morning I was back into it. I am enduring the pain and discomfort for a goal I prize. I hope that my endurance is sustained throughout this year. 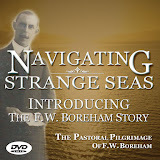 This Sunday I am going to draw upon one of the most inspirational stories of endurance I have ever heard. As a result the remarkable endurance shown by the leader of the small band of men who feature in this true story, he is now regarded as "the greatest leader in human history ever". See you Sunday for an inspirational time and don't forget our church BBQ after the morning service. The Gospel's central offer is not - Heaven. Heaven is not even a side benefit to receiving the Gospel. In fact, Heaven is virtually irrelevant to the Gospel. To be sure there is no other way a person can enter Heaven than to accept the Gospel. And it is certainly true that Heaven can only accept those who have been transformed by the Gospel. No doubt Heaven is s place of sublime bliss that will give the Gospel believer the ideal environment for our eternal rewards, But the Gospel is not about Heaven! The Gospel is about Jesus, not Heaven. Consider this shocking question: If you died and went to Heaven and then discovered that Jesus wasn't there, would you want to be there? The greatest benefit of the Gospel is that brings a believer into a fellowship with Jesus. This doesn't start in Heaven, it starts here..
Am I besotted with Christ? Do I read the Scriptures to gain a more intimate understanding of the One who loves me more than any other can or could? Is my obedience to Christ because l love Him more than any other treasure? Do I believe Christ because He can give to me - would I still love Christ if He never gave me another thing? Do I start my day, live my day, and end my day with devotion to Christ? Does my praying reflect a heart that accepts that God demands of me and not the other way around? Philippians 3:7 But whatever gain I had, I counted as loss for the sake of Christ. Phil. 3:8 Indeed, I count everything as loss because of the surpassing worth of knowing Christ Jesus my Lord. For his sake I have suffered the loss of all things and count them as rubbish, in order that I may gain Christ. Consider Jesus today and this year. Father, help us to treasure Christ as our Supreme Treasure. Cause us to delight ourselves in knowing Him and being known by Him. May we pray, pray, pray to be in constant union with Christ. May our love for Christ be the single greatest delight of our lives. Help us to be so besotted with Christ that we are transformed by His life, His words, His mission, His cause, and His goals. May we as a church each behold Christ this year together in our community of brotherhood. 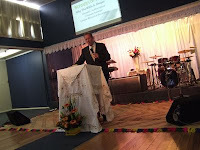 The first Sunday of 2009 I was privileged to speak in a great Tongan church- Westgate Christian Fellowship, in Braybrook Melbourne. The pastor is Salesi Kanongataa and is a great friend. My whole family was with me for this Sunday. 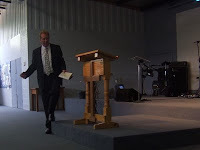 I shared with the church on the unique authority of God's Word and the need (especially for Pentecostals) to "test" so-called 'prophecies' by the Scriptures and proven brothers and sisters. The following Sunday our family was two children lighter (Tyrone was now in Queensland and Zoe in Geelong). 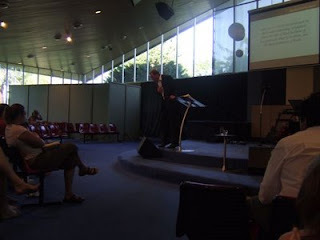 The church in Benalla is "Life Church" and it was one of the most impressive churches I have been in for a while. 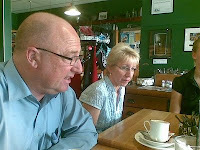 The pastor of Benalla Life Church is Daryl Marshall and he is a great guy. The folk at Benalla warmly received us and made me and the girls (Kim, Ebony and Ruby) feel right at home. I shared with the folks of Benalla an exposition of Ephesians 4:17-21 and emphasised the classical principles of Biblical hermeneutics from this text. We look forward to building the connection with Daryl and Pam and their church. 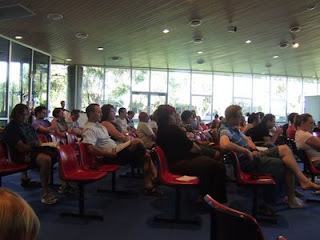 The third church I spoke at this year was Shepparton Assembly of God. I served in this church back in 1989 as a youth leader. We return to Tasmania this weekend where I will be speaking at the Mersey Christian Church in Latrobe and then Legana Christian Church the following Sunday. The Sunday after this (February 1st) I will ministering in Annapolis, Maryland (USA). I would appreciate your ongoing prayers for these preaching engagements. Just a few weeks ago I spoke with a teacher from Lillydale who told me a touching story of a European exchange student who was allocated to this unlikely school. She was a very studious girl who had come to Australia to learn. Yet most of her adopted fellow students did not consider learning the reason they went to school. At the Leavers' Dinner she gave her farewell speech. She shared how that back in her own country education was the most prized acquisition a person could have. As such, she shared, her parents had been making huge sacrifices all her life to ensure that their daughter received the best education that they could nearly afford. Her trip to Australia was a part of her quest to acquire this most valued possession. She then turned her focus off herself and directly toward her temporary fellow students. In Australia, your government gives you an education and most of you have refused to take it! In my country this same education costs two and possibly three lifetimes to repay. If we do not value education and learning we are not going to be able to compete in the marketplace or job-market, and we are consequently looked down upon and considered for the most menial jobs. Her Australian peers listened in stunned silence. They had never considered the enormous privilege that they had just spent the last few years squandering. They had valued amusement (a+muse=no thinking) over education. What do you value most? The other day Kim asked me what I would quickly grab from our house if I only had a few seconds before it burnt down. It's an interesting question. Would you grab your wallet or your photo album? Would you grab your favourite device or a piece of art? What would you have if you could have more of one thing? Jesus said, "Do not lay up treasures on earth...but lay up for yourselves treasures in heaven" (Matthew 6:19-20). Jesus went on to explain- "For where your treasure is, there your heart will be also." (Matthew 6:21) The problem from Christ's perspective isn't 'treasure' but rather, what is 'treasured'. It's not about what things you have- but about what things have you. For some people, money is their most prized possession. But the Scriptures give us a list of things worth far more than money, and better yet, often don't initially cost money either. Romans 13:8 ¶ Owe no one anything, except to love each other, for the one who loves another has fulfilled the law. I hope that in the year ahead we value our spiritual growth and all that is associated with it- fellowship, Bible Study, prayer, worship, assembling, serving, contemplating God and His Word, seeking God's supernatural provisions, evangelism, and the opportunity to help someone else to grow spiritually. Father, help us to value your treasures. Help us not be obsessed with material wealth or things. Help us to avoid debt but to always live as though we have a debt of love toward others. Lord, I pray that we can prize the riches of fellowship, the wealth of wisdom, the gems of insight and correction from others, the joy of Your grace toward us. Pastorally, one of the more frequent issues that I have tried to help people with over the past year related to their disappointment with God due to seemingly unanswered prayer. As I look at Scripture, I see several clues that God gives us that helps us to understand what seems to be unanswered prayer. 1. "No" is an answer. 2. Matthew 6:33 advises us what to do before we pray. 3. First John 5:14 is our prescription for guaranteed answers to pray. The next time you think that God is not listening and consequently not answering your prayers, remember these three truths. Here's some additional interconnected insights from Scripture. 1. Pray with faith (Matt. 21:22; Mark 11:24). 2. Pray with perseverance and patience (Luke 18:1; Ephesians 6:18). 3. Pray with at least another believer (Matthew 18:20; James 5:16). I pray that we will all be pray-ers who are not easily detered from petitioning God for Him to outwork Matthew 6:33 and 1John 5:14 into our lives. Father, help us to pray and never give up pouring our heart out to you. Cuase our hearts to yearn for Your greatness to be demonstrated in our our lives. Cause us to prayerfully rest in your will. Help us to pray without ceasing with our minds, our words, and our lives. Help us to pray together. Help us to pray for your Word to be fulfilled in every life. Lead us by Your Spirit into intercession and fruitful praying.